What's Super Bowl without GOOD FOOD? The big game isn't ONLY about ordering pizza and wings. That's regular season game stuff. Super Bowl is about bringing your "A" game when it comes to the food. Maybe that means cooking and keeping a close eye on your "HOLY MOLY" chili all day as it simmers in the pot so it's perfect for when the game starts. Or maybe it means turning a blind eye to the fact that it's forty below outside and braving the elements anyways in your New York Giants jammies to grill some awesome ribs! 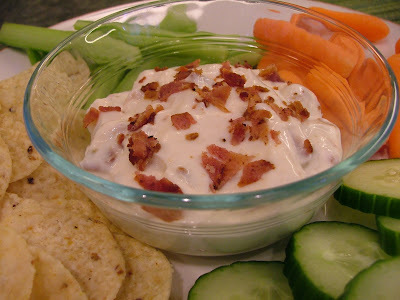 As for the dip, you can whip up a fresh batch of this Bacon Onion Garlic Dip. Save the store bought chip dip in the plastic tub for the preseason. Surround this creamy dip with veggies (yes I said veggies) and chips and you're set for the pre-game show! 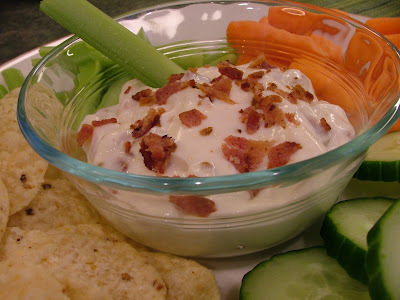 This dip isn't fancy schmancy (that's what makes it perfect for a football game) but it's damn good! The picture below will give you a sense about how much I liked it. It was taken about 10 minutes after I took the photo at the top. The Giants and Patriots will be bringing their "A" game...how about you? Or will you even be watching the big game? Apparently the recipe below makes enough for one person. Double or triple the recipe if you're having friends over for the game. Cook bacon in a skillet over medium heat until crisp. Chop into small bits. 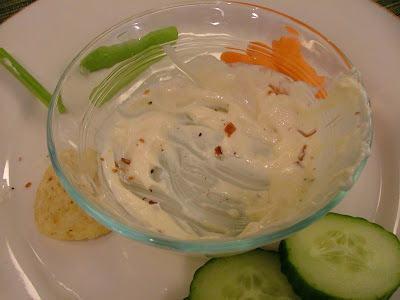 In a bowl, mix together mayo, sour cream, cheese, garlic powder and onion salt. Stir in half the chopped bacon. Sprinkle remaining bacon bits on top. Serve with cut fresh vegetables and chips. If you're looking for more food ideas for the Big Game, I'll be sending newsletter subscribers a collection of Super Bowl recipe ideas this Friday. Subscribe to get your copy! Labels: "chip dip" "bacon" "super bowl recipe" "snack" "dip recipe" "bacon dip"